Seller is Motivated. where can you buy this much HOME Value on St Pete Beach? "WALK TO THE BEACH" from this very Spacious one-bedroom style, Regency West 1 condo 1 bed 1 bath layout, sitting on the Bay. No dogs sorry. Located directly across from The Gulf Of Mexico! A perfect winter retreat yet large enough for year-round living. This condo offers a generous living room/dining room combination, a comfortable bedroom with separate vanity area and walk-in closet. A light and bright fully equipped kitchen, plenty of cabinets complete the picture, except for the Gulf breeze with palm tree views to its western pool. The Sunny Florida room overlooking the water, double as the additional bedroom for your guests with its walk-in closet and privacy glass, sliding pocket doors. Lifetime Warranted; hurricane insulated windows. Unique to this building and 1145sq ft layout are the magnificent height and width of these 5 windows as the 1350 sqft only has 3. Keep the FL room and Add Bed/Bath. Certain Luxury Vynal Plank is allowed. Storage locker and shed to store your bicycles and Kayaks. The Regency West Community offers two pools, one Bayside, two large fishing piers, a patio gathering area, shuffleboard courts, and a fitness room in the Clubhouse. A very active. Better amenities than most, yet still affordable. Some own fee simple but most are a land lease, this significantly reduces Regency West's taxes and buying price. 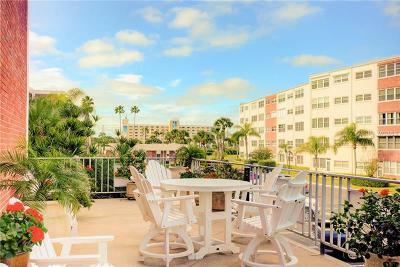 Walking distance of several restaurants, shops, make it your beach living, dream today.